Agia Napa and the Sea: A Different Dimension! 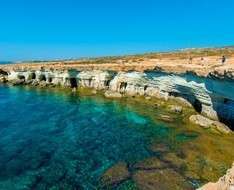 This «walk» gives an insight to the historic connection of the area of Agia Napa with the sea and the recent growth of the small fishing village to a splendid modern resort. All along, the tour gives one the opportunity to learn more about the area, and admire its natural beauties. The participants ride on a fully restored vintage bus to the sculpture Park, a sea-view open-air gallery exposing the work of over 100 artists, who have exhibited their works around the world. Next on the programme is a short ride to the breathtaking Agia Napa Sea Caves and to the National Park of Cape Gkreco. A short walk follows to “Korakas Bridge” a ‘must-see’ geological formation that resembles a bridge or arch over a sea cave and the picturesque chapel dedicated to Agii Anargiri situated on the north of Cape Gkreco. After a coffee break the tour continues along the coast and ends at the 15th century Byzantine church of Agia Varvara. The guide’s commentary focuses on familiarizing the participants on the area and offers further information on various other sites that the visitor may wish to explore on his own or with an organised tour. Language: Every other Thursday in English - German & English – Swedish. Starting point & Reservations: Tourist Information Office – Agia Napa (12, Kryou Nerou Avenue, CY-5330, T. +357 23 721 796). Offered free of charge by the Agia Napa Municipality and organised in ollaboration with the Deputy Ministry of Tourism and the Cyprus Tourist Guides Association. First to book, first to join! So, booking in advance (leaving name & hotel) is necessary. NO Walks held on public holidays.